Parents just don’t get most things about being a kid. Like needing to sleep in. Or getting nutrition from sweets. Or, especially, bad school reports. So if your parents are doing their nut at you, here’s your secret weapon. 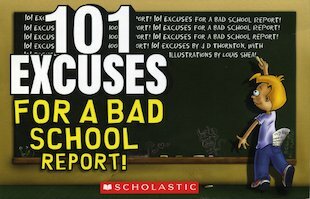 A little book of excuses to get you off the hook. Tell your parents about the interfering aliens, rampaging bees and faulty alarm clocks that are really to blame for your rotten report. No more merciless authoritarian punishments for you! This book looks amazeballs! I don’t need excuses I only need make some thing up like…..... Oh this teacher only started a week ago and has just guessed on every1 LOL! I dont have bad school reports. 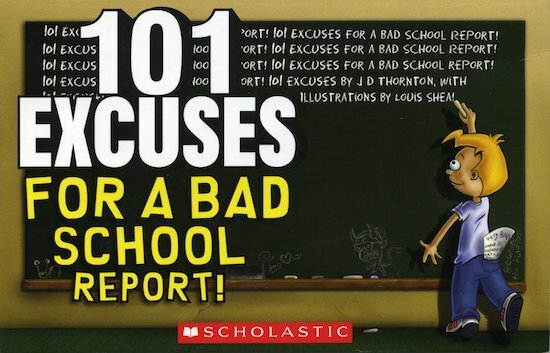 if you can make the effort to read this book you can make the effort to try hard and be good at school.